Over the years GlobalGiving has become increasingly focused on helping organizations around the world better listen to the people we serve. We launched the Storytelling project in 2010 as one way to give communities a voice and get organizations to listen. We collected over 60,000 stories from East Africa and provided analysis tools to extract insights from what people talk about. Now, GlobalGiving’s Feedback Fund is taking a different approach. We’re supporting 19 of our nonprofit partners as they build feedback loops with the people they serve. We held a webinar to introduce the Feedback Quiz (a self-diagnostic tool) and the Feedback Labs Toolkit – where hundreds of tools have been reviewed. We thought, if each organization could create a customized feedback system, we might glean insights and lessons from these experiments that would benefit all GlobalGiving nonprofit partners. We continue our series on story-centered learning with an update on our efforts to hear from those affected by the earthquake and tsunami in Japan in 2011. We wanted to understand how people and organizations tried to help communities in Tohoku since the 2011 Japan earthquake and tsunami. From July 2013 to present (December 2014) we have collected over 2,000 stories from individuals about the activities that people engaged in following the disaster in Tohoku, Japan. These stories are being collected in order to further support local organizations that continue to provide needed assistance to the affected areas. The project is administered by the Israeli-based NGO IsraAid (IA) and its Japanese affiliate the Japan IsraAid Support Program (JISP). The storytelling team held workshops at over 20 schools and universities. After, participants conducted interviews among themselves or completed paper forms. The storytelling team also volunteered in everything from debris removal to being a camp counselor for children. Participating in volunteer activities enabled the scribe to earn trust. Volunteering together with people in the disaster region, the Storytelling Project both assists people in the disaster region and collects information about how to assist them further. Please read the translated blog about some of their activities: ameblo.jp/japanstorytelling. They also have a Facebook page with routine updates about their activities: www.facebook.com/jpstorytell. As a reward for participation, respondents were given a cute bendable pen. 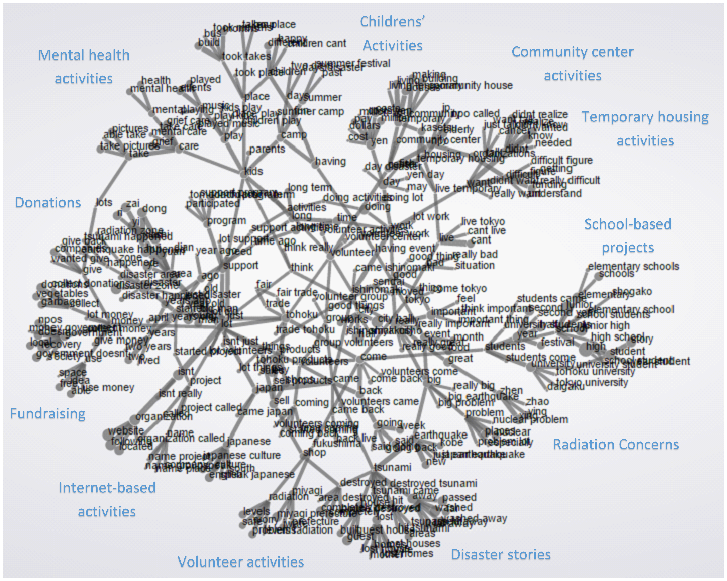 Further analysis using GlobalGiving’s tools on storylearning.org revealed 10 themes: mental health activities, children’s activities, community center activities, temporary housing activities, school based projects, radiation concerns, disaster stories, volunteer activities, internet-based activities, fundraising, and donations. Using these themes and others, Prof. Takehiko Ito of Wako University and the Japan Storytelling Project director, Keith Goldstein, are preparing a publication for the March 2015 International Society of Life Information Science Conference in Tokyo. The paper is entitled: “Tohoku Stories: Identifying Happy Themes of Disaster Relief”. We gathered lessons from many perspectives to create a multi-faceted view of the disaster recovery. The majority of activities are organized by a small circle of staff and large circle of volunteers. Organizations are primarily based in Tokyo or Tohoku. Often staff in Tohoku are originally from Tokyo, Kansai, and other regions. Organizations that continue to be effective succeed by collaborating with other organizations. Collaboration with pro-bono legal teams is especially important, as foreign fundraising has exponentially decreased and domestic support is contingent on bureaucratic regulations. 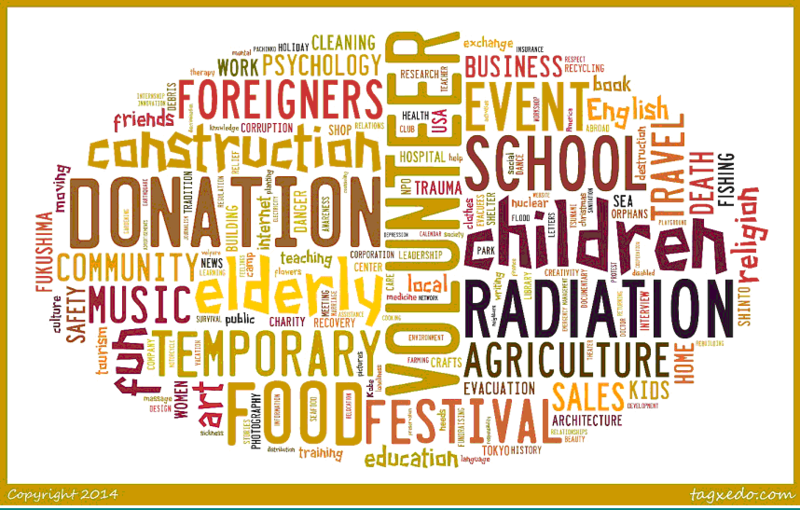 Many people from outside Tohoku (especially from Tokyo) would like to participate in future volunteer activities but lack information on where to volunteer and what they can do. Volunteers often spend their personal expenses to make trips to Tohoku, which cost about 30,000 yen ($300) per weekend. More support is needed to alleviate these personal costs to enable them to volunteer more. More long-term projects in education, economic development, and psycho-social support are needed. A large number of projects ceased working after the first year. Many organizations burned through funding that was slated on a yearly basis with the hope of getting a renewal. After 3 years the majority of programs were discontinued. Support for the elderly is one of the most pressing needs in Tohoku at the moment. Temporary housing units are populated primarily by elderly, whose physical, mental, and emotional conditions are quickly deteriorating. Discrimination is a big problem felt by residents of Fukushima. People don’t want to visit Fukushima, buy products from there, or have relationships with people from there. Local residents feel this is unfair, as there are radiation checks and other neighboring prefectures are often equally affected. While internal solidarity is expressed by locals, subliminal comments hint at high levels of anxiety and growing frustration. Numerous mentions of suicide by local farmers and others were discussed. In order to further facilitate data collection, the storytelling team also developed a DIY survey. Have you heard about an interesting project that helps people in Tohoku? If so, please fill out this short online 3 minute questionnaire to tell us about activities that you know about: http://www.basileis.org. We at GlobalGiving believe that effective disaster relief begins by hearing from the people most affected by the earthquake, flood, storm, civil war, or other catastrophic event directly. We are grateful to IsraAid for their effort to help the people of Japan speak, and hopeful that all future disaster recovery efforts will include a mechanism for voices from the ground to inform what happens. This is part 2 of our blog series – stories of story-centered learning. The next story comes from the Center for Peacebuilding in Bosnia. Our programmes involve storytelling as a means of dealing with the past in Bosnia and Herzegovina, yet we never documented it. We joined storytelling because we needed to save this data. The beginning of the project was not without challenges. One challenge was collecting two stories from one person. People seem to find it ok to think of a story, but for two they need more time. Some volunteers have been told they would get interviews from various people, though they would need to wait for them to have two stories ready. When we went to Fenix (a local organisation that provides social services for people), we also faced challenges. One thing we learnt from this experience is that trying to be more spontaneous did not give as good results as when we would schedule interviews with one person at a time. From a quantitative point of view it was better, but the quality of the research was not as great as in the past. The stories were very heavy, and seeing how much people rushed to us to tell us what had happened to them was very sad and exhausting. We were literally drained of all energy after just two hours. I also noticed that the amount of information decreased. The stories, as important as they all were in content, got shorter the more we stayed there and the more people we interviewed. The fact that we started collecting stories during Ramadan meant that it was harder to meet up collectively to follow the progress. In the beginning a lot of people seemed to think it would be impossible to collect 100 stories. In the end, it was probably the more skeptical people that helped us reach out to their connections, and always tried to help us find more people to interview. They became a part of the project. What resulted from this, was that there is now a large group of people in Sanski Most, not affiliated to CIM, who know exactly what the project is about and they now believe it is something more people should take part in. That is great considering it was through networking and people recommending the interviews that we managed to collect a lot of the stories. People involved in the project, directly or indirectly, don’t do this because they have an incentive, but because they now believe the GlobalGiving storytelling project is very interesting. Some people specifically think it is a great idea to gather data and are impressed by the method used. The secret ingredient to gathering these stories was trust, and people buying into it. It wasn’t necessarily about locals or foreigners doing it, but about people getting used to the project itself. In a way I do believe there is not one specific way to collect stories in our case, and after reflecting on challenges we’ve encountered and feedback from people, we will in the future focus on two methods. One is the relaxed method, which a lot of the people prefer and it’s more organic: collecting stories by just living here. That means, whenever volunteers hear a story they believe needs to be documented to kindly ask if they could do it. If the people trusted you to tell you that story in the first place, they will most likely trust you to write it down as well. I also believe that this could potentially lead to the sustainability of the project, and documenting stories and data collection becoming part of our organisational culture. The second method is the approach GlobalGiving recommends: giving people good incentives to collect stories. I do believe though that for the future we have to consider greater incentives, whether that is something material, or not. Or perhaps reach out to those people for whom the same incentives we offered at the beginning of the summer would make a much greater difference. Finally, the storytelling project motivated us to use a more story-centred approach in our programmes, be it though social media, our newsletters, or grant writing. We have already used some of the data we’ve gathered for reporting purposes, and we will continue to make the best use of it in future relevant contexts. 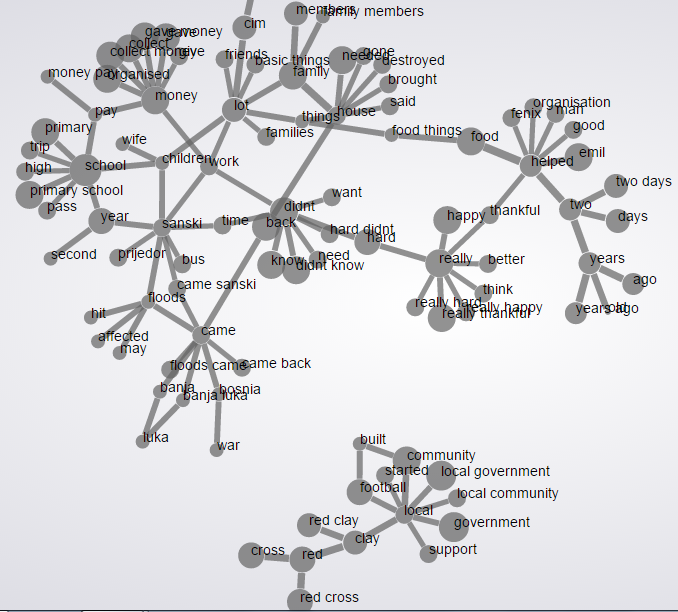 When all our stories were analyzed as one collection, two separate maps emerged. One had language about projects about the government, local government, and the Red Cross flood relief. The other map had the bulk of stories, mentioned many local issues, but did not mention government. Deeper analysis with BigML revealed that the “What is needed to address this problem” question was the most divisive one. This year we are revising our programmes, and developing a new strategic plan for the next five years. Therefore, storytelling will help inform us not just about the needs of the community, but also how they perceive problems, and why people are inspired to contribute to grassroots change. In this way, we can consider the results of the analysis when deciding what projects we will keep, and what projects we will focus on developing. By the end of the year, we also hope to share the results of the storytelling collection with the local community. Adelina, the project leader for this organization, has shared her stories of change in a series of posts. How can listening to community voices save the forest? This week GlobalGiving will be posting stories and insights from organizations that tried out a story-centered learning approach in 2014. The La Reserva Forest Foundation (LRFF) is dedicated to replanting, restoring and protecting tropical forests in Costa Rica. 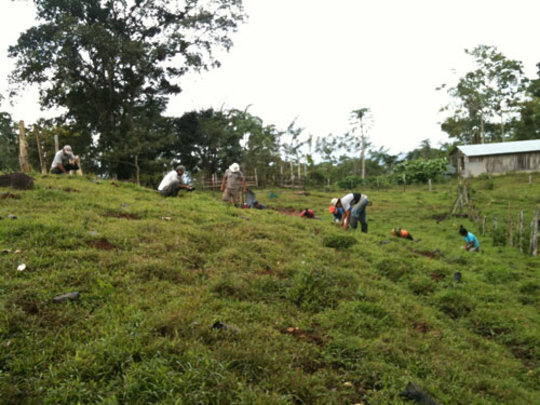 Through native-tree nurseries, tree planting, Payments for Ecosystem Services (PES), eco-tourism and educational initiatives, LRFF works closely with the local community to achieve both environmentally and socially desirable outcomes. Even though our projects regularly bring LRFF into contact with the communities we seek to serve, running a small volunteer-based not-for-profit organization often prevents us from formally collecting feedback and better assessing local needs. This made the GlobalGiving Storytelling Project – with ready-made questionnaires, funding for implementation, analytical tools and a team of experts ready to answer questions – an incredible opportunity for LRFF to listen, learn and respond to community input. (1) They say it better than we do. A long time ago before the town of Malecu spoke Spanish, there’s a story that tells of a time when the Malecu lived united, and took their food from the forest but with moderation. One day, soldiers from Nicaragua came to the Malecu territory and saw that the land was rich with many trees. These individuals began cutting down the trees, which were the home to both the animals and the Malecu. The Malecu did not know whether to leave their territory or to defend the land that gave them their subsistence. The Nicaraguans had an advantage given that they had firearms, while the Malecu only had bows, arrows, and spears. The Nicaraguans killed our men, stole our children, and raped our women. The Malecu fought for their home, but the river was filled with blood due to the massacre. The Malecu’s loved and continue loving nature. Although deforestation is still a problem, there are individuals who are now planting trees and we are now winning the fight. This is how our town chooses to protect the environment and our food. When I was at school seven years ago, our teachers asked for a tree to seed on the riverside. All our classmates wondered why they wanted those trees and the benefit of it for the future. Now I understand the trees have their own purpose and that purpose was that as years pass by, companies want to cut trees down for their business and some trees species are not seen anymore. Some time ago my grandfather told me that he wanted to reforest a piece of land with a lot of weeds and all of the grandchildren, about 8, helped to plant different species of trees like Manú, ojechee etc. The trees keep growing until today and our family has its own attraction. We’re thus integrating key quotes from the stories into our marketing materials, website, holiday fundraising campaigns and social media. (2) It challenges our assumptions. Even though our results are preliminary and our data is disseminated from a relatively small sample size (e.g. approximately 120 stories), one thing is clear: high-quality community feedback will surprise you, challenge your assumptions and remind you to think twice when you make a decision as a non-profit organization. We tend to promote our projects to local landowners by emphasizing the financial incentive that they will get for reforesting their land. However, when our sample was asked about the needs that their stories addressed, they tended to focus more on security, respect and fun compared to other stories in the database. It’s not just about putting food on the table for our communities, so in future projects we’ll be more careful to ask about, rather than assume, motivations for involvement and design projects to address community’s needs, rather than our perception of them. #1 – Tell me a story about a time when a person or organization tried to help someone or change something in your community. #2 – Scale: Events like these happen often/rarely. #3 – Multiple choice: Who would you go to if you wanted to solve this problem? #4 – Events in your story affect me/community/world. (3) It’s the beginning, not the end. We believe that this is not a one-time conversation for us or the communities we work with. For us, adding the storytelling project as a line item to each monthly board meeting helps serve as a reminder that this is an ongoing conversation for the organization. In addition, by undertaking feedback collection again in a year we can grow our sample size and build better quality data. We can also better track impact/changes in communities if we continue this exercise and improve our data collection process over time. For example, one third of our “baseline” storytelling were not stories about positive outcomes. GlobalGiving tells us this is normal, even healthy, because it means the community is sharing what they really think. Furthermore, the prevalence of tentative, question and discrepancy words in our data set also suggest that there are still some taboo topics that need to be tackled.